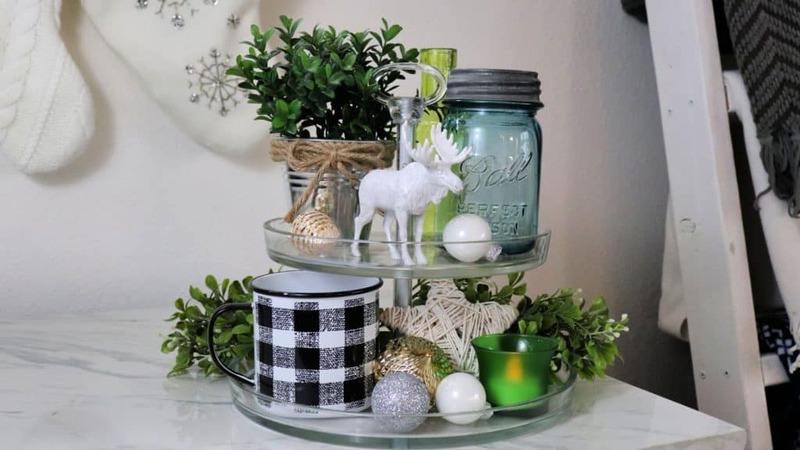 One of my favorite ways to decorate a small space in my home is with a tiered tray. These trays are ideal for displaying a collection of coordinating pieces and bring a festive feel to little corners of my home. This Christmas tiered tray is on my TV stand, just under our stockings. It’s a lovely way to display some of my neutral farmhouse items, mixed in with a little gold and silver. You can watch how I styled the tray and be sure to check out the other home decor projects at the end of this post. To style this Christmas tiered tray I pulled out items to fit a theme I had in mind. I wanted a neutral look with white and natural elements, along side some gold and silver. My decor style tends to be more bright, shiney and modern but this little tray allows me to try something different that still blends with the rest of my home. 2 new pieces on this Christmas tiered tray are the metal buffalo check mug, it’s a lot like this one, and it make a great gift! Or get one for yourself, I fully intend to use this once the season is over. 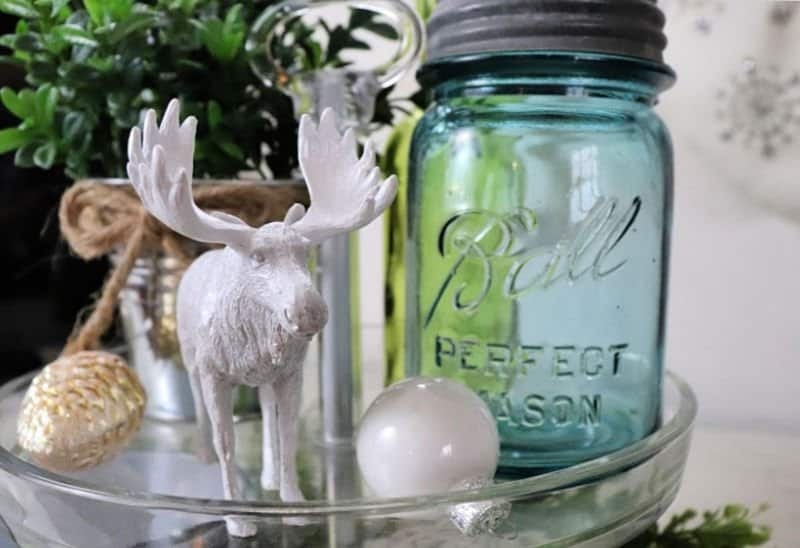 I also picked up this cute moose ornament from Hobby Lobby. When styling a Christmas tiered tray, I like to lay all my items out then start by adding the large pieces to the tray first. Once those are on the tray, I fill in the gaps with the smaller items like this twine ornament, a tea light and metallic balls. 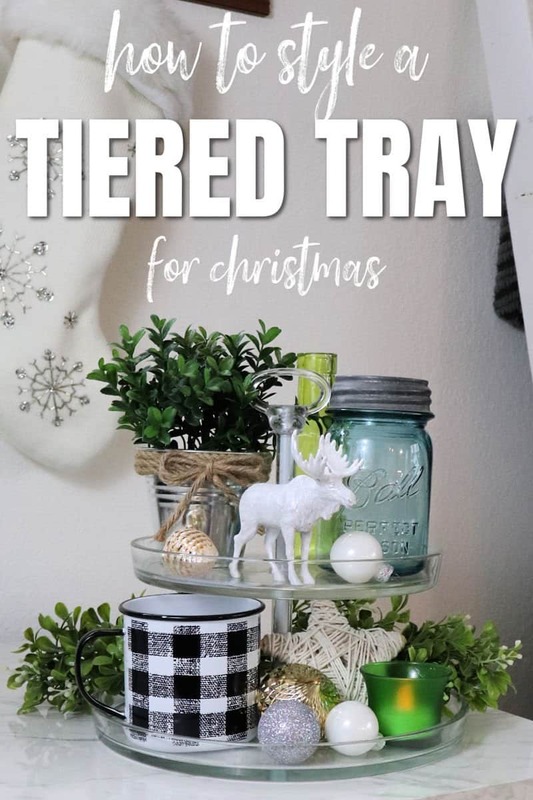 If you like this Christmas tiered tray, be sure to pin it! If you want more inspiring Christmas home decor, check out these posts. I just love your style. You have such an eye for detail. What a darling way to create a Christmas tray! Thanks for all the fun and inspiration on the Deck the Home blog tour! Love your tiered tray styling. I am just about to create my own in the coming weeks. Such a great tiered tray! I haven’t finished mine yet so now you give me some ideas! Thanks for the inspiration! I want to do one this year but was at loss on how to style it! Love your tiered tray! They are so fun to decorate! That moose ornament is adorable. 🙂 Love it all! Great tutorial! I always struggled with this. Beautiful! I love the combination of items you picked – Happy Holidays! I love tiered trays and could spend hours decorating them. Your is absolutely adorable!